The Refined Geek » Tiny Terahertz Chip Could Have Huge Implications. 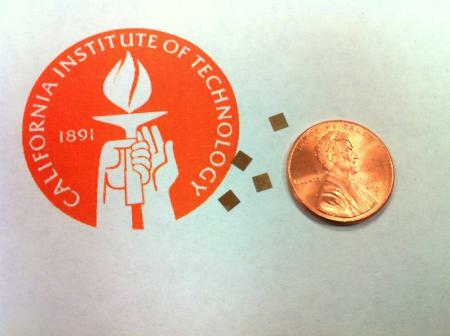 Tiny Terahertz Chip Could Have Huge Implications. You’re probably familiar with a couple frequencies that are used in every day life thanks to their ubiquitous nature. Cell phone towers operate in the Megahertz range usually from about 800MHz up to 2100MHz (depending on your carrier), microwaves and wireless networks operate just above that in the 2.4GHz (2400MHz) range (which is why using your microwave can wreck havoc on your wireless) and your car radio operates well below that, typically in the 80MHz to 110MHz range. These frequencies have proven to be the most useful from a technological perspective for many reasons but there are frequencies on either side which could also provide some benefits and new research might just have them in your pocket sooner rather than later. Researchers from the Caltech Institute of Technology have created a silicon chip capable of transmitting in the terahertz frequency band. The demo of their technology is pretty impressive being able to image a bullet and razor blade hidden within a innocuous looking teddy bear. This chip, able to be easily integrated into portable platforms like smartphones, could revolutionize the industries that current rely on terahertz systems that are far larger and could never really be classed as portable. There’s also potential for it to find its way into many other applications in places like the medical industry and wireless communications although how well it will do in the latter is up for debate. You see terahertz signals don’t fair too well in our atmosphere that’s got a whole bunch of water floating around in it. Terahertz waves are completely blocked by water or metal and their effective range in air is about 10 meters which means it won’t be making waves (ha!) as your next cellphone frequency. That range is still within the realms of home wireless communications though so its entirely possible that it will find its way into WiFi access points or ad-hoc communications networks sometime in the future. It’s even more plausible given the size of the chips that they’re already producing. Some of the more exciting applications are in medical imagery as terahertz waves can penetrate through the skin and into the fatty tissue layers below before being reflected back by more water-logged layers. This can then be used to accurately image and measure the density of lesions on the skin providing a painless and non-invasive way to determine if they’re cancerous. According to LA Dental Town they’re apparently quite good for dentistry as well being able to provide 3D models with a much higher resolution than current dental x-ray technology. This might not be the most impressive or game changing technology around but its certainly up there in terms of potential for enabling applications of terahertz technology that weren’t possible before. Including things like this in smart phones could open up a whole host of interesting products and services. The big boost in wireless connection speeds for WiFi networks would also be a welcome addition as it’s still something of a poor cousin of the trusty CAT5/6 cable.